Drew Brees engineered a come-from-behind 28-14 victory over the Tampa Bay Buccaneers to help the New Orleans Saints clinch their second consecutive NFC South title. 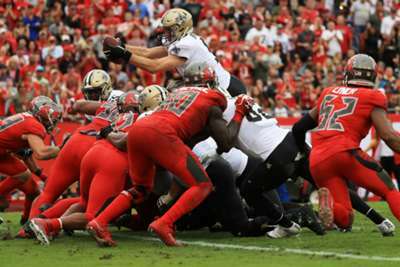 The Buccaneers had an early advantage at Raymond James Stadium, entering half-time with a 14-3 lead after holding the Saints scoreless in the first quarter and putting together two quick touchdown drives on Sunday. Then came star quarterback Brees, who led the Saints on four successive scoring drives while New Orleans' defense shut out Jameis Winston in the second half. Brees passed and ran his way into the end zone to help stop a Buccaneers team that won their last two games. He finished 24-of-31 passing for 201 yards and two total touchdowns. The Saints defense also showed why they are one of the best in the league. New Orleans held Winston to a 47-percent completion rate (18 of 38) with 213 yards and the two scores, as well as one interception. While Winston moved the team down the field, more times than not the offense was forced to punt. The Buccaneers only converted six of 14 third-down attempts. Buffalo Bills running back LeSean McCoy was ruled out against the New York Jets after suffering a hamstring injury in the first quarter. Meanwhile, Jets rusher Isaiah Crowell went down with a foot injury and did not return. Washington Redskins tight end Jordan Reed exited the game against the New York Giants after suffering a foot injury in the first quarter. Kansas City Chiefs offensive guard Cameron Erving never returned to the field after he suffered a knee injury against the Baltimore Ravens. Houston Texans wide receiver DeAndre Carter exited with a concussion against the Indianapolis Colts. Philadelphia Eagles cornerback Sidney Jones and running back Corey Clement both sustained injuries and were listed as questionable to return against the Dallas Cowboys. Jones hurt his hamstring, and Clement left with a knee injury. Defensive end Josh Sweat was also questionable after suffering an ankle injury. Pittsburgh Steelers quarterback Ben Roethlisberger sustained a rib injury and had to leave the clash with the Oakland Raiders. He was quickly evaluated in the locker room and was later able to return. Detroit Lions defensive end Ezekiel Ansah was ruled out against the Arizona Cardinals with a shoulder injury. Also, defensive lineman Da'Shawn Hand suffered a knee injury and was not able to return and both wide receiver Bruce Ellington and safety Charles Washington left the game with hamstring injuries. Tom Brady set the NFL record for the most career touchdown passes in league history with his two-yard touchdown pass to Julian Edelman in the second quarter against the Dolphins. He now stands at 580 career touchdown passes, including regular season and postseason, after tying Peyton Manning's mark of 579 last week. But, Brady's efforts were halted by an impressive walk-off lateral. The Dolphins 69-yard touchdown on the final play is the longest play from scrimmage to win a game with no time remaining in the fourth quarter since the 1970 merger. Julio Jones had a record day. The Atlanta Falcons receiver became the first player in league history with 1,400 receiving yards in five successive seasons. Kansas City Chiefs kicker Harrison Butker did not have the performance he is known for. Butker missed two field goals in the same game for the first time in his two-year career. Amari Cooper helped the Cowboys overcome the Eagles in overtime, and his efforts set an NFL record. Cooper became the first player in league history with three, yes three, go-ahead receiving touchdowns in the fourth quarter or overtime of the same game. Quarterback Mark Sanchez was benched in favour of Josh Johnson in the fourth quarter with the Redskins down 40-0 to the Giants. They went on to lose 40-16 with Sanchez throwing two interceptions on 6-of-14 passing. After the game, Sanchez said it was not a lack of effort that lost the NFC East showdown: "I was proud of the way guys fought and hung in there even when things started to turn. You get a tipped interception on really what could have been potentially a breakout play. … Things kind of snowballed from there." The "Miami Miracle" was not supposed to happen according to quarterback Ryan Tannehill: "The play kind of got messed up. I saw Kenyan [Drake] there, I said [to Parker], 'pitch it! pitch it!' He pitches it, Kenyan came back inside. ... Then I saw him and [Rob Gronkowski] about 10 yards away. I said 'Gronk's on the field? We got this!' So, yeah, it was pretty amazing. I was following behind and I actually just turned around and collapsed just with the emotion of the whole thing."